I prefer the design without shimmer. I prefer it without shimmer too, any smudging isn't noticeable and the pattern shows better. I love Dashica plates, I have 2 that I adore. That is beautiful!! I love the different layers of color. I wish I was good at stamping! I think I just need to practice more. Thanks for sharing! Very pretty! I really like the one without the shimmer. I really Loved it! I would love to join the Adventures in stamping group? 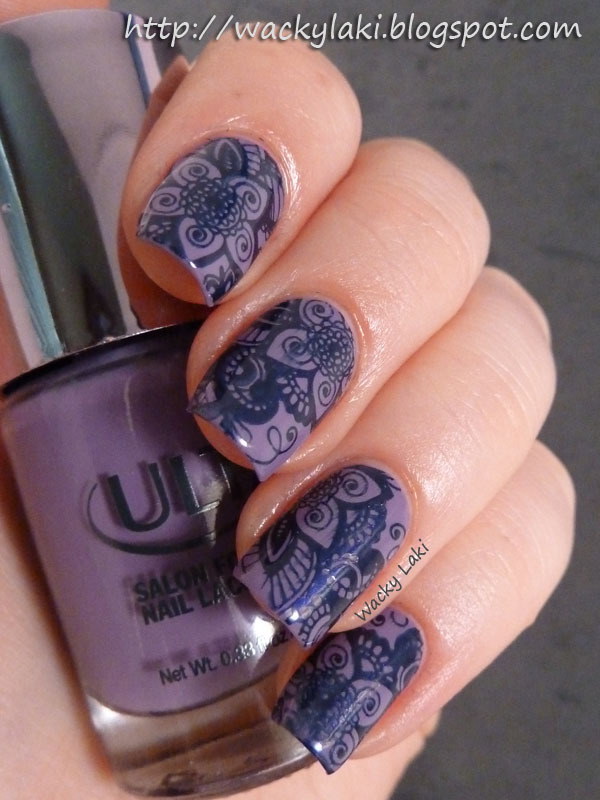 This is gorgeous, I love this stamp! I love this so much! It's beautiful both ways and that dusky purple is awesome! very pretty. i love that each nail is different. Absolutely beautiful! I wish I wasn't so terrible at stamping! Ahh you've discovered Shirley's plates too... They're very pretty! I ♥ them! These are so stunning! I love that image too. I'm new to your blog so I'm unfamiliar with it. I love all of your stamping that I've seen so far. 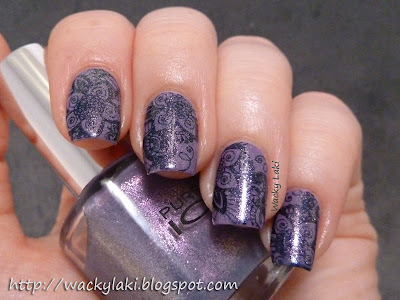 Do you happen to have a stamping tutorial? Or maybe a list of stamping materials to get a newbie started? As far as a list of supplies all you need are the stamping plates, a stamper and scraper (old credit card works well). There are a ton of different plates available. Ones I would recommend right now are the Mash set (http://www.mashnails.com/mash-plates-26-50.html) or the Bundle Monster set (http://www.bundlemonster.com/top-sellers/25pc-nail-art-stamping-image-plates-2012-collection.html). You can also purchase the stamper/scraper on the mash website as well. Also, depending on where you are, you could find the Salon Express kit in your local stores (RiteAid, CVS, Walgreens, etc). It has everything you need to get started.. Wow...I LOVE this! The colors look awesome together!